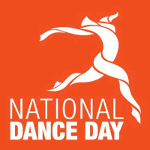 National Dance Day in the United States is held on the last Saturday in July. This annual observance was created by Nigel Lythgoe, producer of the television dance competition show So You Think You Can Dance. Besides, every year DFF records instructional videos with dance routines. The routines are created by renowned choreographers and feature So You Think You Can Dance alumni. The videos typically become available on iTunes a month before National Dance Day.